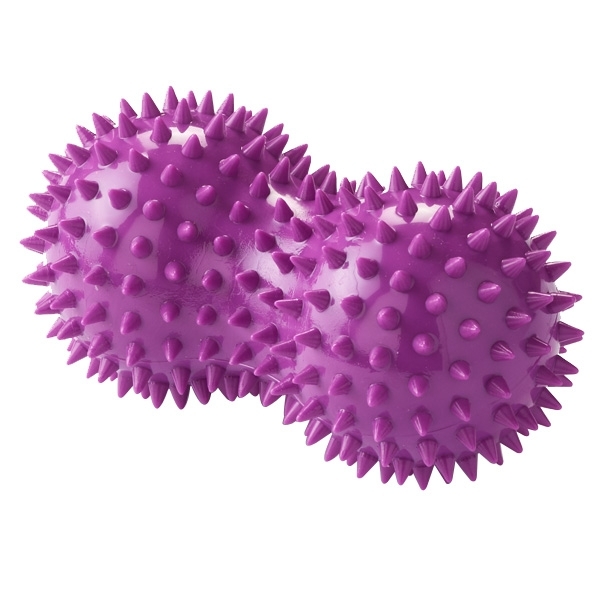 Stimulate the senses and increase circulation while releasing muscle tension with Eric Franklin's Fascia Massager™ Peanut. The firm points wake up sensory receptors in the body, which not only increases blood flow to local areas but makes you more aware of your body and how it moves. Performing simple tactile and imagery exercises, like slowly swiping your foot across the Franklin Fascia Massager™ Peanut or rolling through the arch, will relax tense muscles while preparing the foot for weight bearing and increased movement. The organic profile of the Fascia Massager contours to the body, offering an invigorating massage when rolled along the calf or any tense muscle group. The rolling, kneading motion releases soft-tissue adhesions, liberating the fascia and restoring natural movement. Latex- and phthalate-free. Measures approximately 5½" L x 3" dia. Sold each. I suggested them to a patient scheduled for surgery for plantar fasciitis. After one week of daily use, he cancelled the surgery and was able to start walking again pain free. If your feet are tired, tight, achy, numb, or unhappy these will help. Leave them by your favorite chair and use while watching Sports Center. Unreserved recommendation!!!!! Not sure if you can tell from the picture, but the nubs are pretty darn pointy. I didn&apos;t think I would like it at first, but I find the points almost energizing. It feels like all your nerves are firing and ready to go. It&apos;s great for your feet (with socks on) because it kind of wraps around your arch when you roll back and forth. One of my other favorites is rolling my forearm up and down the peanut while I&apos;m sitting at my desk. The only negative was that it stunk a little bit when I first got it. No problem, though. It went away pretty quickly and it says phthalate free, so it&apos;s not made out of the bad plastic.